Description: The church of St. Domenico in Rieti near Rome (Italy) was not only raised from ruins recently, but it was furnished with an exceptional instrument. The pontifical organ dedicated to the pope Benedikt XVI is significant in several ways. First, there are not many instruments which were dedicated to the pope and built under the vivid attention of the papal authority. The secretary of the Vatican state, cardinal Tarcisio Bertone was himself the honorary president of the committee for the construction of the instrument. Second, it is one of the finest instruments of Bartolomeo Formentelli, who built the organ in 2007. The name of the organ builder is itself a mark of quality. However, there are also other reasons why this instrument is remarkable. It may be surprising that the instrument is entirely modern. Why is it then called by the name of the famous French organbuilder of 18th century? The organ is in no way a replica of any Dom Bédos instrument. Rather, the principal idea which guided the construction of the instrument was to create the organ following closely and meticulously the instructions recorded in the famous book L´Art du Facteur d´Orgues by the Dom Francois Bédos de Celles (published in 1766-1770). The benedictine monk gave very precise and detailed instructions on all the procedures concerning the construction of the organ. Following his guidelines exactly should therefore result in an instrument which - although modern - should have all the qualities of the Dom Bédos work, almost as if he would build it himself. This organ allows us to physically "touch" and experience the Dom Bédos organbuilding ideas. The organ case was projected after the treatise of Monsieur Andreas Roubo le Fils L´Art du Menuisier Carrosier (published in 1768). The design of the organ case follows the Roubo's project of "Buffet du Grand Orgue" and indeed, the organ is based on the 32' Montre! There are only two other instruments in Europe of this kind, the Dom Bédos organ in St. Croix at Bordeaux, and the Moucherel organ in Albi. The result is trully magnificent and surprising. The most striking feature is the voicing of the flue pipes: the timbre is dominated by an extraordinary expressive chiff and also the steady portion of the tone is pushed on the edge of the pipe speech stability with rather strong presence of the hiss of air passing through the pipe mouth - all this contributing to the unusually light and harmonically rich tone color. One is forced to ask whether these tonal qualities are really mirorring the fashion of the time of Dom Bédos (which is after all probable - it was time of intense expresivity in organ sound, stylistically very different from -for example - the typical sound of a French organ at the beginning of 18th century) or whether the nature of Bartolomeo Formentelli took over here. Most probably both the aspects contribute to the result. 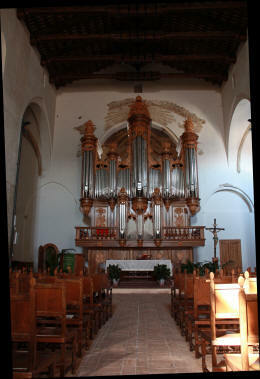 The organ of St. Domenico in Rieti is therefore a modern meditation on the Dom Bédos heritage. This makes it a unique instrument. The organ is designed as five manuals plus the pedal. The lowest manual is the rear Positif, the smaller brother and the solo manual for the Grand Orgue, which is based on the 32' Montre and occupies the second manual. The third manual is designed to complement the Grand Orgue with the powerful reeds - the Résonance. The Trompette de Bataille and the upper part of the Clairon is horizontal "en chamade". The fourth manual is the Récit and the upmost manual is the Écho.